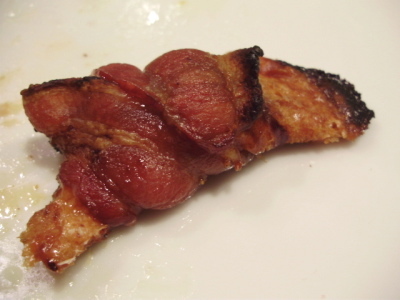 A willing (and lucky) participant in The Great Bacon Experiment, I was able to sample the porcine delights prepared by CDKitchen.com’s founder, Valerie Whitmore. With many recipes to test, Valerie needed the right audience. I was ready. Whether my arteries were or not remains to be seen! 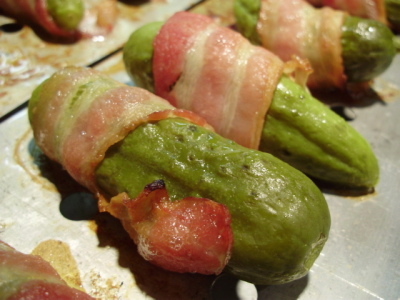 Baby Kosher Dills were the pickle of choice to be lovingly swaddled in bacon, then broiled. So simple, and SO good. 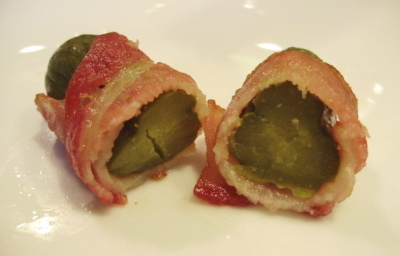 The size was perfect for a two-bite appetizer, and the dill retained its crunch. 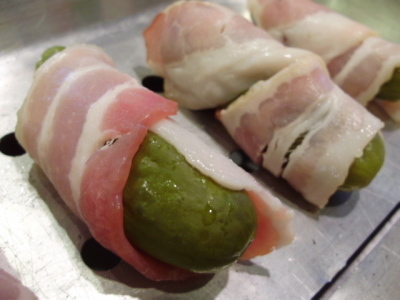 The smoky saltiness of the bacon stood up to the bright, tangy pickle, and the colors made for a pretty platter! Mini Butterfinger and Milky Way bars were used here. 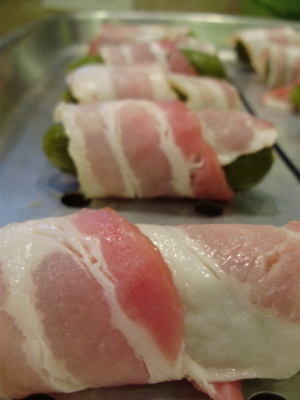 Even after freezing them for a bit, the bars, unfortunately, did not stand up to the heat of the broiler. 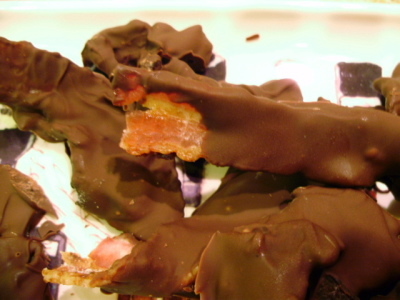 However, in the name of research, we persevered and came up with the following hypothesis: Molten Butterfinger + Crispy Bacon = Yummy. 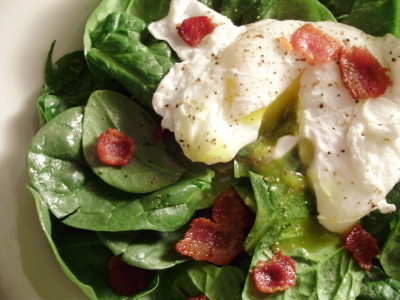 Another simple recipe (let’s face it, you don’t have to do much to bacon to make it edible), that really set our wheels turning with other applications. 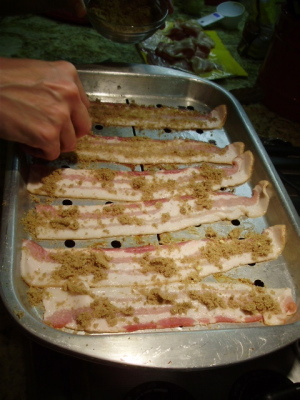 Brown sugar and dry mustard powder was sprinkled liberally on the bacon, which was then carefully broiled on both sides. 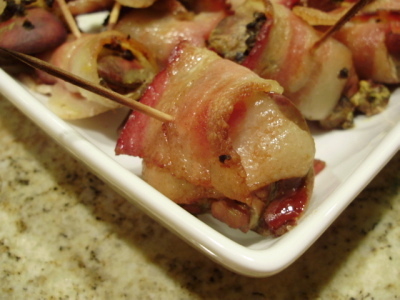 The result was a frightfully delicious, caramelized piece of bacon that had us wanting more. 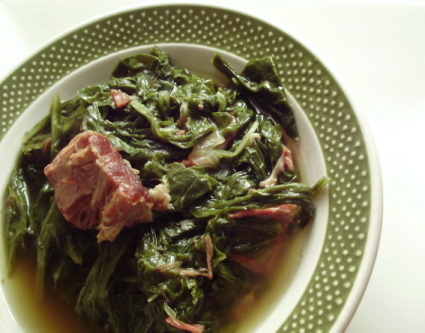 We thought it would be perfect mixed in pancake, cornbread or cupcake batter, used as a hot cereal topping, or sprinkled on a spinach or frisee salad with poached egg. We ate every last bit of this one, which is why there is no photo of the finished product here. 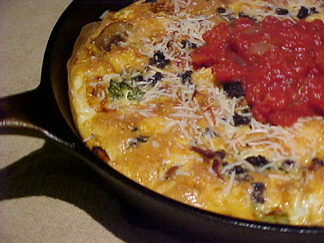 Valerie managed to snap one; it’s on CDK (but you already know this tastes good, no matter what it looks like). 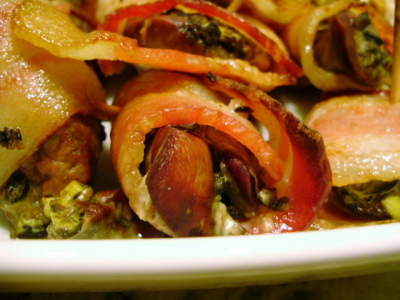 Unlike most bacon and chicken liver recipes, this one called for broiling instead of deep-frying, and used yellow mustard and chopped black olives. 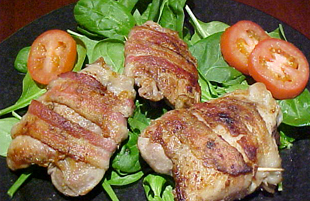 The result was a juicy, moist and delicious chicken liver and tender-crisp bacon. Absolutely fantastic. 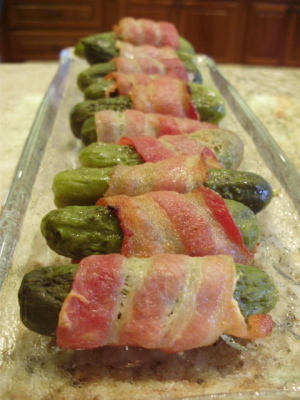 The mustard and olives were not that noticeable, but could have helped set the moist interior. 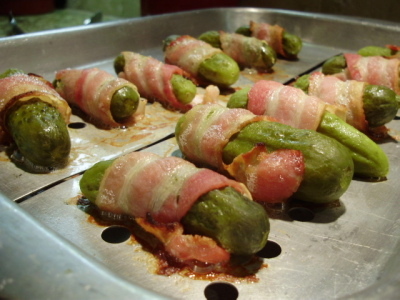 We also forgot to roll the wrapped livers in bread crumbs (“what was this can out for?”) but they were not missed. Anyone who knows me can tell you that I do NOT like watermelon. That is another story entirely. But it was with an explorer’s heart (and stomach) that I opened my mind to try out this morsel. Yes folks, I ATE WATERMELON. 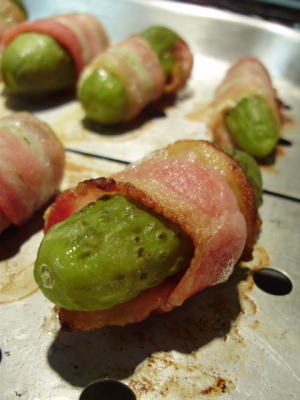 Above all, I was stunned and pleasantly surprised at how cooking (albeit brief) transformed the flavor and texture of the watermelon. It became denser, and although still juicy, it hardly resembled the cold, mealy fruit I despised. It felt much more like the texture of a tomato. 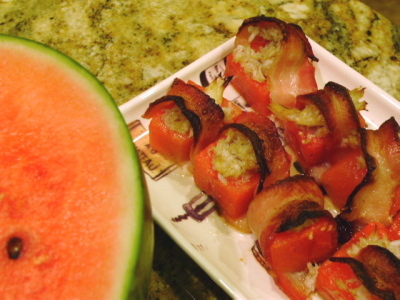 Of course, the bacon flavor was key, complimenting the warm blandness of the melon, but the crab felt odd at first. We realized there needed to be more of a bridge between the gap, and after a simple sprinkle of salt, I ate another piece! Even better than the first one! 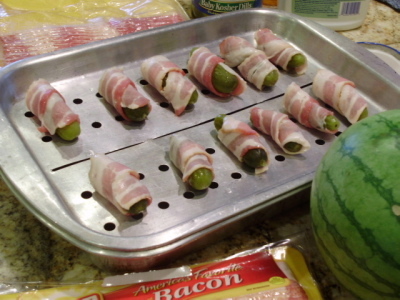 While this might not make me a complete watermelon convert, it does speak volumes about how bacon can truly make everything taste better! Yeah. That’s right. 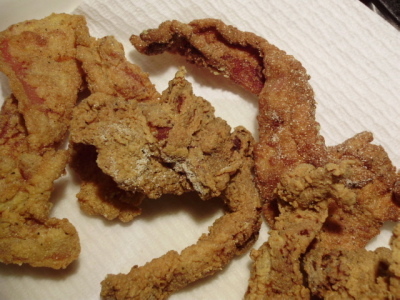 Chicken Fried Bacon. You’re already jealous, and you should be. This was incredible. 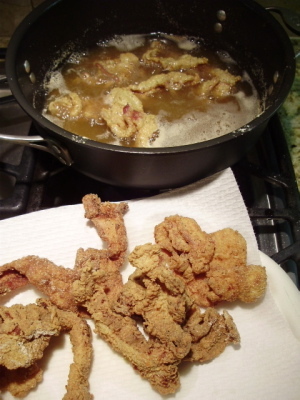 Like most good fried recipes, simplicity was the key here. 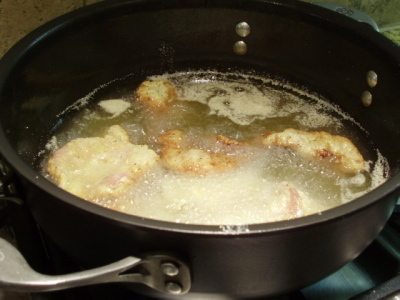 A mixture of white and corn flour was used to coat the bacon twice, with a dunk in evaporated milk in between. 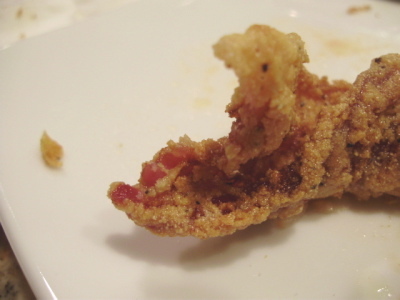 The result was a crazy-delicious, crispy piece of bacon that gives new meaning to “finger-lickin’ good”. The corn flour helps make a crisp but tender coating that holds up even after overnight storage, whether in the fridge or smuggled away in your sock to nibble on in the privacy of your bedroom. 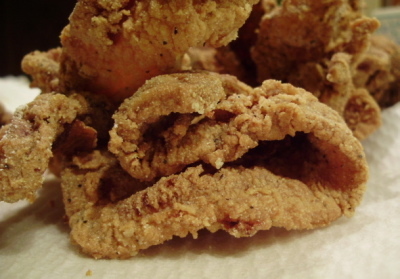 The coating at once reminds you of the best fried fish or chicken you’ve ever had, while that wonderful, fabulous bite that is unmistakenly BACON sends you over the edge. 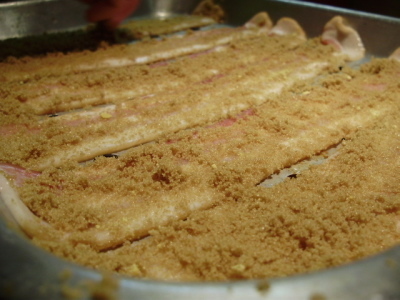 Thick-cut bacon was used here, and with excellent results. 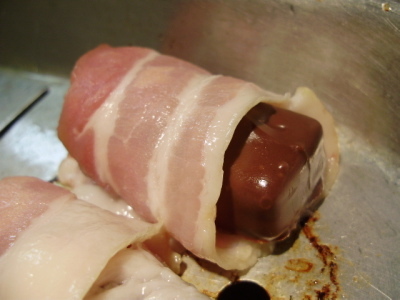 Bacon was cooked, cooled slightly, coated with melted semi-sweet chocolate, then chilled. Insanely delicious, especially at room temperature, when the flavors are at their peak and can truly sing together. 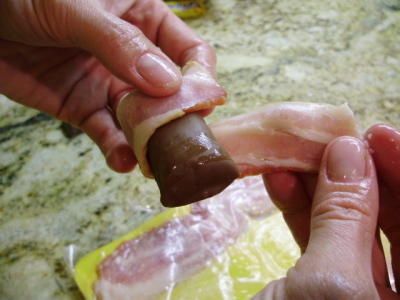 While bacon and chocolate might seem an odd combination, one taste of this will make you a believer. While all this bacon had most of us “porked out” for a few days, it was certainly a fun, flavorful event. We sampled various wines throughout the evening, including a cabernet, a merlot and a malbec, all of which paired nicely. Plain water tasted remarkably refreshing afterwards as well! Many thanks to Valerie and her husband Brent for hosting this event. Can’t wait for the next one!